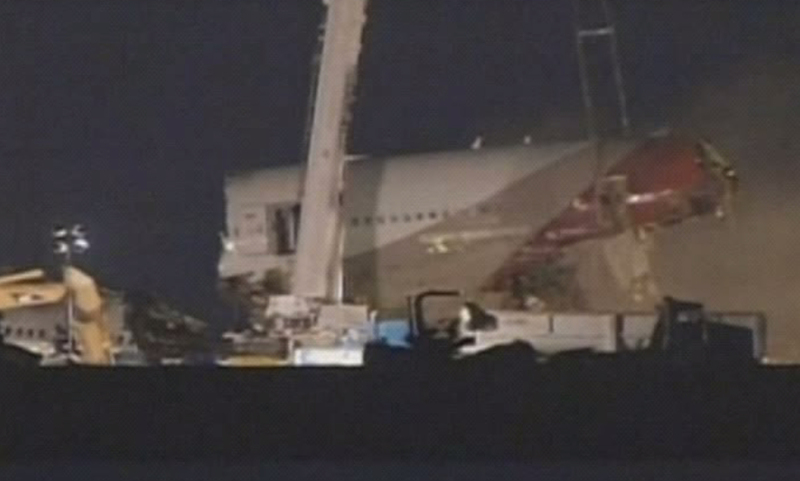 SAN FRANCISCO Crews removing the wreckage of Asiana Flight 214 at San Francisco International Airport have encountered smoke. Smoke billowing from the wreckage overnight Friday was captured by KGO-TV cameras. The news station says it occurred moments after crews used a sling to lift the fuselage. The station says some debris fell out. It appears that the wreckage has since been removed. Calls to airport and fire officials to determine the cause of the smoke were not immediately returned. National Transportation Safety Board spokesman Keith Holloway says the agency was not overseeing removing of the wreckage, and he did not know anything about the smoke. Airport officials are aiming to re-open the runway by Sunday. The closure has led to flight cancellations and delays. Nearly a week after Asiana Flight 214 collided with a rocky seawall just short of its intended airport runway, investigators have pieced together an outline of the event  what should have been a smooth landing by seasoned pilots turning into a disaster. With each new bit of information, the picture emerging is of pilots who were supposed to be closely monitoring the plane's airspeed, but who didn't realize until too late that the aircraft was dangerously low and slow. Nothing disclosed so far by the NTSB investigators indicates any problems with the Boeing 777's engines or the functioning of its computers and automated systems. "The first thing that's taught to a pilot is to look at the airspeed indicator. It is the most important instrument in the cockpit," said Lee Collins, a pilot with 29 years and 18,000 hours experience flying a variety of airliners. "Airspeed is everything. You have airspeed, you live. You don't, you die." CBS San Francisco reported three patients injured in the crash remained in critical condition at San Francisco General Hospital Thursday. Those patients include one juvenile, hospital spokeswoman Rachael Kagan said. There are also four other patients--three adults and a juvenile -- still at the hospital in serious to good condition, she said. Investigators are still trying to nail down hundreds of details about the crash last Saturday that killed two people and injured dozens. NTSB Chairman Deborah Hersman has cautioned against reaching conclusions. But investigators already know a great deal. They've listened to the Boeing 777's voice recorder, which captured the last two hours of conversation in the cockpit. They've downloaded its flight data recorder, which captured 1,400 indicators of what was happening on the plane, from the temperatures inside and out to the positions of cockpit instruments. The flight's four pilots have been interviewed, as have passengers and dozens of witnesses. Air traffic control recordings and video of the flight's last moments, including the crash itself, have been examined. The pilot flying the plane, Lee Gang-kuk, 46, had nearly 10,000 hours of flying experience, but just 35 hours flying a Boeing 777. He had recently completed training that qualified him to fly passengers in the 777, and was about halfway through his post-qualification training. He was seated in the left cockpit pilot seat. In the co-pilot position was Lee Jeong-Min, an experienced captain who was supervising Lee Gang-kuk's training. It was Lee Gang-kuk's first time landing a 777 in San Francisco. At 11:19:23 PDT, after a nearly 11-hour flight, the plane was traveling over the San Francisco Peninsula. The weather was near perfect, sunny with light winds. Lee Jeong-Min and a third pilot sitting in a jump seat just behind the main seats, a first officer, were supposed to be monitoring the plane's controls. One of their most important jobs was to closely monitor the plane's two airspeed indicators. In the U.S., if an amber bar is more than five knots above or below the target speed during landing, the pilot flying is supposed to abort and make another attempt, according to pilots interviewed by The Associated Press. As the plane descended to 1,600 feet, the autopilot was turned off. At 1,400 feet, the plane's airspeed was about 170 knots. The flight data recorder shows the plane's autothrottle  similar to a car's cruise control  was set on idle during the approach, Hersman said, and that there were multiple commands at times given to the autothrottle and autopilot. At 11:26:58 and 1,000 feet, the pilots made contact with the airport tower. When they were cleared to land 12 seconds later, the plane's altitude had dropped to about 600 feet. The plane was configured for its approach and the landing gear was down. The airspeed was about 149 knots. A target speed of 137 knots was set. At 500 feet there was an audible automated altitude alert. The airspeed was about 134 knots. At this point that pilots realized they weren't properly lined up with the runway, Hersman said. "Between 500 and 200 feet, they had a lateral deviation and they were low. They were trying to correct at that point," she said. At 200 feet and another automated altitude call out, the airspeed had slowed to 118 knots  well below the target level. At this point, U.S. pilots would typically call for an aborted landing because the plane was more than 5 knots below its target speed, Collins said. But at no point in between 500 and 100 feet does the voice recorder show the pilots making any comment related to airspeed, Hersman said at a briefing Thursday. Hersman said at earlier briefings that it was not until 200 feet  16 seconds before impact  that Lee Jeong-Min, the instructor pilot "recognized the auto-throttles were not maintaining speed." At 125 feet and 112 knots, both throttles started moving forward, indicating more fuel was being sent to the engines to increase power and speed. That was eight seconds before impact. Even if the autothrottles weren't fully turned on, either of the pilots in the two front seats could reach down and manually push the throttle levers forward to increase power. It was about this time that the cockpit voice recorder indicated the first officer  the third pilot seating behind the front two pilots  realized the plane was traveling too slowly and called for an increase in speed. A second later, Lee Gang-kuk's yoke can be heard rattling violently on the voice recorder. This is the sound of a stick shaker going off, a piece of safety equipment that tells a pilot the plane is about to stall because it has slowed to a dangerous speed and lost lift. When the pilots in the two front seats realized the plane was in trouble, they both reached for the throttle. Passengers heard a loud roar as the plane revved up in a last-minute attempt to abort the landing. At three seconds before impact, the plane reached its slowest speed of 103 knots. Its engines were at 50 percent power and power was increasing. At this time, one of the pilots called for an aborted landing. At one and a half seconds before impact, another of the pilots calls for an aborted landing. At 11:28, with the airspeed up three knots, the landing gear, followed by the plane's tail, collided with the seawall just short of Runway 28 Left. The plane careened wildly before slamming down onto the tarmac and sliding about 1,000 feet. The tail was sheared off and three flight attendants seated in the back of the plane fell out. Rocks from the seawall and pieces of the mangled landing gear were strewn along the runway. The NTSB's investigation is being followed closely by pilots in the U.S. and around the world. At one gathering of pilots in Dallas Wednesday night, the discussion centered on why the Asiana pilots didn't realize their low speed sooner. No one had an answer. "There are a lot of very experienced airline pilots who are scratching their heads right now," Collins said. Meanwhile, crews removing the plane's wreckage encountered smoke early Friday morning. The smoke was captured by KGO-TV cameras, and the news station said it occurred moments after crews used a sling to lift the fuselage. It appears that the wreckage has since been removed. Airport officials hope to re-open the runway by Sunday. The closure has led to flight cancellations and delays.